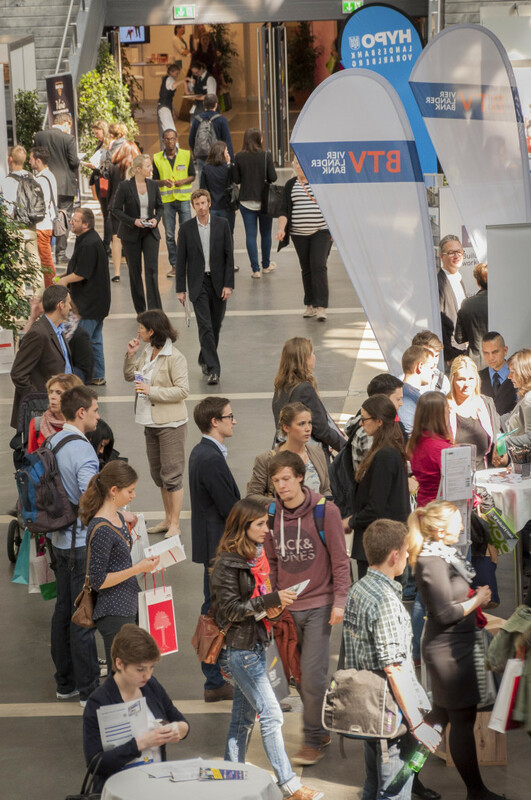 The CAREER & Competence is the largest job and career fair in Western Austria. The event is a platform where all students and graduates from universities in Tirol get to meet local, national, and international companies and organizations. There is, of course, no entrance fee. … are looking forward to answering your questions during the event. You can inform yourself about job openings or the company in general. Our exhibitors come from a wide field of activities and industries – you are sure to find what you are looking for, regardless whether your field of study involves mathematics, information science, engineering, the natural sciences, law, technology, the economic or social sciences or the humanities. More than 15 universities from all over Austria will present their different master programs and looking forward to help you. Ca. 56 exhibitors from the most diverse fields of business offer jobs, internships and consulting during the event. You can find a list of exhibitors in the exhibitor directory. Throughout the day, representatives from different companies and recruiting experts will talk about job applications, career opportunities and career design. Application photo: At the “basics” Stand in the foyer, a photographer will take professional application photos (9:00 – 12:00 and 13:00 – 16:00). CV check: At the conSALT stand, you can have your application documents checked (please bring a print-out) and you will get detailed feedback and improvement tips. Free breakfast: The first 100 visitors of the CAREER & Competence receive between 09 and 10 a.m. a breakfast for free. Free Coffee: You can get a free coffee at the C&C cafeteria powered by Hofer KG. Of course, all services are free of charge. At the CAREER & Competence you will again have the opportunity to have our photographer take your professional application photo. Bring your curriculum vitae to the CAREER & Competence and the experts from conSALT will check it in detail and discuss it with you. Success with your next application interview is almost guaranteed! Throughout the day you get coffee for free in the cafeteria / Martello Lounge. With the friendly assistance of the HOFER KG. Between 9:00 and 10:00, the first 100 visitors will receive a free breakfast at the CAREER & Competence. Throughout the whole day, lectures and discussion panels will be organized in der “basics” CAREER Lounge, covering all aspects and details of job applications. The program will be announced shortly.